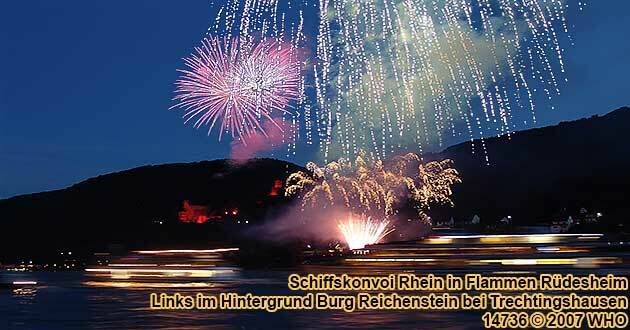 Seven splendid displays of fireworks around the Binger Loch, between Trechtingshausen, Assmannshausen, Bingen and Rudesheim. Between 6:00 p.m. and 9:00 p.m. a fleet of more than 40 illuminated ships will parade past Rudesheim, Bingen and Assmannshausen. At 10:00 p.m. 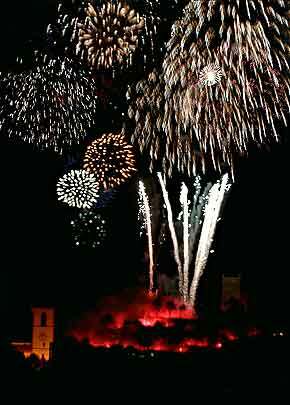 The first spectacular fireworks display will light up the sky in Trechtingshausen beneath the castle Reichenstein. 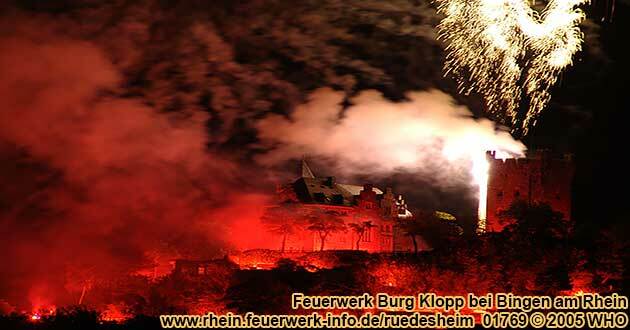 The fireworks will then glide past castle Rheinstein across from Assmannshausen. From the ruins of castle Ehrenfels and castle Klopp in Bingen, the colorful lightnings and the cascading light shoot out as a magical spectacle. 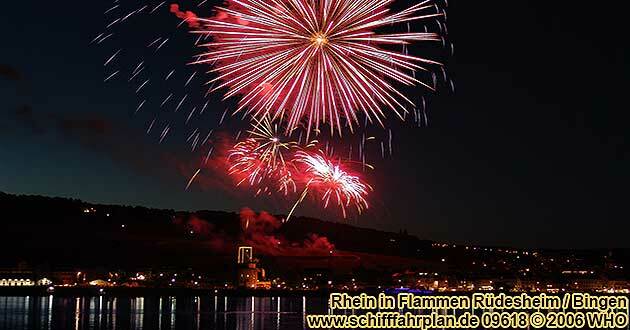 Taking place at approximately 11:30 p.m., the grand finale over Rudesheim is a spectacular display of fireworks that will take your breath away and enthuse everyone once more. Embarkation in Ingelheim-Freiweinheim (in Rhinehesse, about 1,8 km from freeway exit A 60, left Rhine river side) from 5:10 p.m., departure 5:30 p.m. Boat trip "Rhine river in flames". Seating place below deck in a passenger boat, music from a DJ and dance on board. Return Ingelheim-Freiweinheim at about 12:45 a.m. Boat tickets together with welcome drink, buffet, DJ on both decks and drinks (beer, wine and non-alcoholic drinks) per person 126 EUR. Embarkation in Geisenheim (right Rhine river side, about 4 km east of Rudesheim) from 6:00 p.m., departure 6:30 p.m. Boat trip "Rhine river in flames". Seating place below deck in a passenger boat, music from a DJ and dance on board. Return Geisenheim at about 12:30 a.m. Boat tickets together with welcome drink, buffet, DJ on both decks and drinks (beer, wine and non-alcoholic drinks) per person 126 EUR. 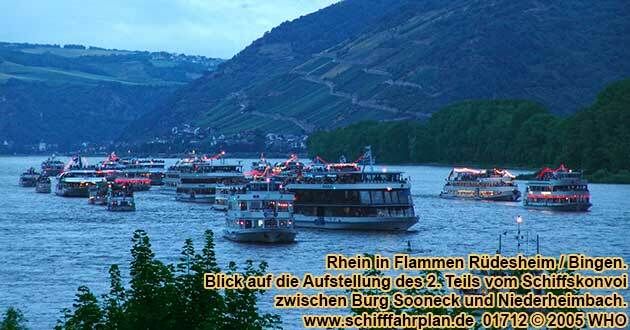 Embarkation in Bingen (left Rhine river side) from 6:15 p.m., departure 6:30 p.m. Boat trip "Rhine river in flames". Seating place below deck in a passenger boat, music from a DJ and dance on board. Return Bingen at about 12:30 a.m. Boat tickets together with buffet per person 96 EUR. Departure in Winkel (town part of Oestrich-Winkel in the Rhinegau, right Rhine river side, about 8 km east of Rudesheim) 5:30 p.m. Boat trip "Rhine river in flames". Seating place below deck in a passenger boat, sole entertainer with live music. Return Winkel at about 12:45 a.m. Boat tickets together with 2-course menu per person 87,80 EUR. 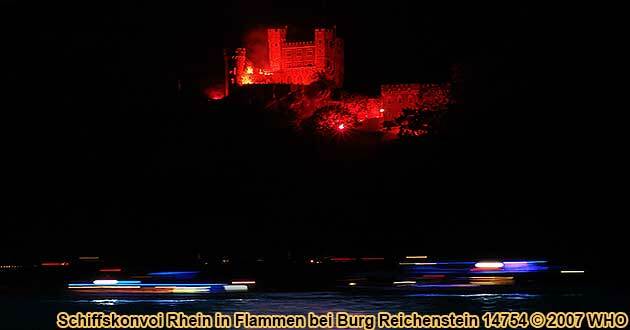 Departure in Geisenheim (in the Rhinegau, right Rhine river side) 6:00 p.m. Boat trip "Rhine river in flames". Seating place below deck in a passenger boat, sole entertainer with live music. Return Geisenheim at about 12:00 a.m. Boat tickets together with 2-course menu per person 87,80 EUR. Departure in Ingelheim-Freiweinheim (in Rhinehesse, about 1,8 km from freeway exit A 60, left Rhine river side) 5:00 p.m. Boat trip "Rhine river in flames". Seating place below deck in a passenger boat, sole entertainer with live music. Return Ingelheim-Freiweinheim at about 12:30 a.m. Boat tickets together with 2-course menu per person 87,80 EUR. Departure in Bingen on the Rhine River (left Rhine River side) 6:20 p.m. Boat cruise, seating place below deck, on board music from the CD player, boat boat trip to the fireworks. Return in Bingen at about 12:00 a.m. Boat tickets together with dinner per person 80 EUR. Departure in Rudesheim on the Rhine River (right Rhine River side) 6:45 p.m. Boat cruise, seating place below deck, on board music from the CD player, boat boat trip to the fireworks. Return in Rudesheim at about 12:00 a.m. Boat tickets together with dinner per person 80 EUR. Embarkation in Assmannshausen on the Rhine River (right Rhine River side) from 7:45 p.m., departure 8:00 p.m. Boat cruise, seating place below deck, on board music from the CD player, boat boat trip to the fireworks. 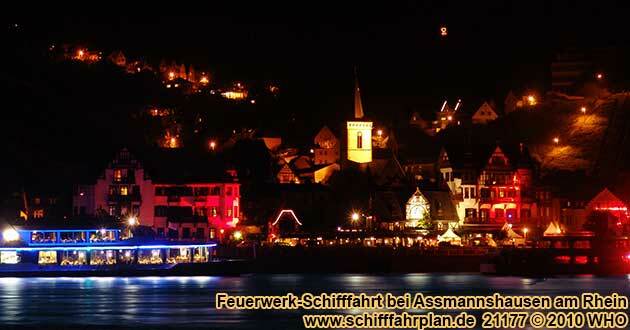 Return in Assmannshausen at about 12:20 a.m. Boat tickets together with dinner per person 80 EUR. Embarkation in Koblenz / Coblence (left Rhine river bank) from 12:30 p.m., departure 12:45 p.m. Boat cruise, seating place below deck in a passenger boat, live music and dance on board, boat trip to the fireworks. Return in Koblenz / Coblence at about 3:30 a.m. Boat tickets together with dinner per person 81 EUR. Departure in Boppard (left Rhine river bank) 2:45 p.m. Boat cruise, seating place below deck in a passenger boat, live music and dance on board, boat trip to the fireworks. Return in Boppard at about 2:35 a.m. Boat tickets together with dinner per person 81 EUR. Departure in Kamp-Bornhofen (right Rhine river bank) 2:55 p.m. Boat cruise, seating place below deck in a passenger boat, live music and dance on board, boat trip to the fireworks. Return in Kamp-Bornhofen at about 2:25 a.m. Boat tickets together with dinner per person 81 EUR. Departure in St. Goarshausen (right Rhine river bank) 4:00 p.m. Boat cruise, seating place below deck in a passenger boat, live music and dance on board, boat trip to the fireworks. Return in St. Goarshausen at about 2:10 a.m. Boat tickets together with dinner per person 81 EUR. Departure in St. Goar (left Rhine river bank) 4:05 p.m. Boat cruise, seating place below deck in a passenger boat, live music and dance on board, boat trip to the fireworks. Return in St. Goar at about 2:00 a.m. Boat tickets together with dinner per person 81 EUR. Departure in Oberwesel (left Rhine river bank) 4:30 p.m. Boat cruise, seating place below deck in a passenger boat, live music and dance on board, boat trip to the fireworks. Return in Oberwesel at about 1:45 a.m. Boat tickets together with dinner per person 81 EUR. Departure in Rudesheim (right Rhine river bank) 7:20 p.m. Boat cruise, seating place below deck in a passenger boat, live music and dance on board, boat trip to the fireworks. Return in Rudesheim at about 12:00 a.m. Boat tickets together with dinner per person 81 EUR. Witness the "burning" of castles on both sides of the Rhine river in a stunning light display, and the light parade of more than 40 illuminated boats. 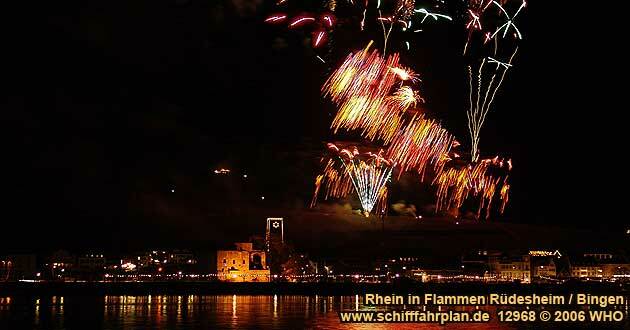 The towns around the Bingen "Loch" celebrate A night of fireworks magic. Join the festivities as Bingen, Trechtingshausen, Rudesheim and Assmannshausen bathe their castles, churches and the beloved Mäuseturm (mouse tower) in an illuminating "Bengal Fire." High above Rudesheim the magnificent Niederwald monument, will also radiate.